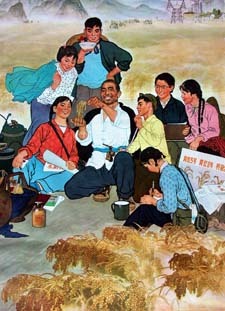 Approximately 17 million privileged city youth were “sent down” to the countryside to learn from the peasants during China’s chaotic Cultural Revolution (1966-1976). Toil in the communes was arduous and unpleasant and food was seldom abundant, but like the local farmers, they endeavored to make do with what there was. They learned to prepare remarkably tasty and healthy dishes with the fresh, wholesome foods in season, to conserve scarce fuel and to improvise when ingredients were unavailable. They used locally grown produce because there wasn't anything else. And they mastered the art of getting peak flavors and maximum nourishment out of unprocessed, low-calorie foods, devoid of artificial preservatives, fresh from the fields, ponds and streams. These are their recipes – entirely authentic, and easy to prepare in an American kitchen. Many are vegetarian. They don’t require exotic ingredients; you can find everything you'll need in a well-stocked grocery store. The step-by-step instructions are easy to follow, and short cuts and substitutions are suggested. There are also many stories - about Chinese food, about the Cultural Revolution and about living in the countryside - that bring the recipes, and the era, to life!